Despite a visual similarity to the Sulphur Knight, this chunky mushroom is easily distinguished by its smell: it has none. Tricholoma equestre (syn. Tricholoma flavovirens) is also known as the Man on Horseback; why that should be is a mystery. 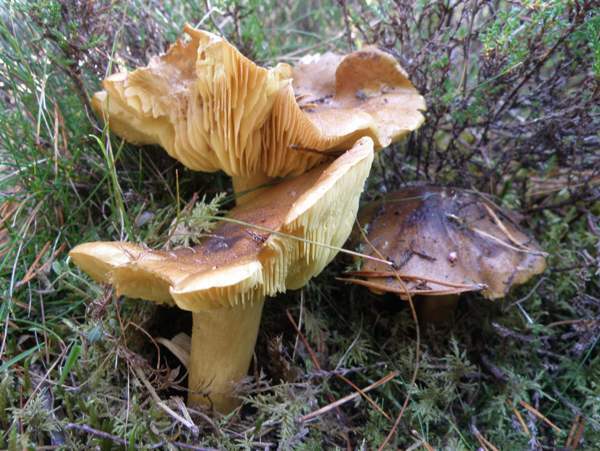 Common in northern Scotland, under Scots Pine in sandy areas but also occasionally with birches and with oaks, this late season mushroom is rarely seen in southern Britain and in Ireland. It was the German mycologist Paul Kummer who, in 1871, transferred this species to the genus Tricholoma, thus creating its current binomial Tricholoma equestre. Agaricus flavovirens Pers.,Tricholoma equestre var. 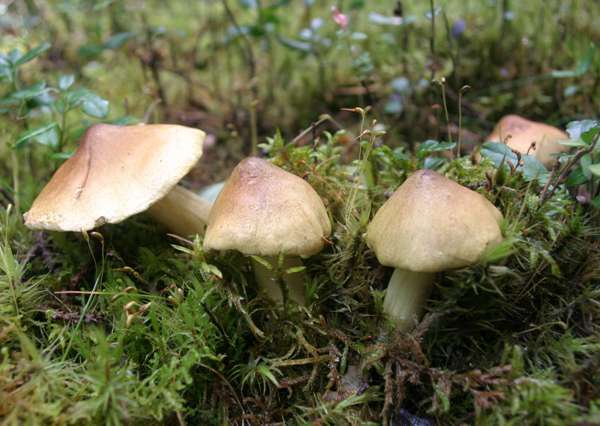 equestre (L.) P. Kumm.,Tricholoma auratum (Paulet) Gillet, and Tricholoma flavovirens (Pers.) S. Lundell. 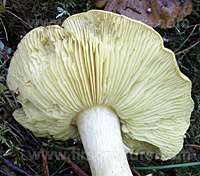 Tricholoma was established as a genus by the great Swedish mycologist Elias Magnus Fries. The generic name comes from Greek words meaning 'hairy fringe', and it must be one of the least appropriate mycological genus names, because very few species within this genus have hairy or even shaggily scaly cap margins that would justify the descriptive term. As a specific epithet the term equestre is not quite so difficult to unscramble; it is to do with horse riding. Look at the mushrooms in the picture above and you will see that they have opened up to become saddle shaped... well, some of them do... a bit! Bright yellow, with a fibrous or scaly olive-brown central area; convex, often with a wavy margin and a slight central umbo; 5 to 9cm across. The flesh is white or very pale yellow. Pale to right yellow; adnexed (often with a notch). Pale yellow; lined vertically with brown fibres; cylindrical; 5 to 10cm long, 0.8 to 1.5cm diameter; no ring. Ellipsoidal, smooth, 5-8.5 x 3-6µm, with a pronounmced hilar appendage; inamyloid. No significant odour. 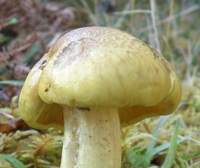 Tasting not advisable: several cases of severe poisoning have been confirmed as being the result of eating, over a period of several days, meals each containing moderate portions of these mushrooms. Mainly under pines, but also mycorrhizal with birches and occasionally oaks. July to October in Britain and Ireland; earlier in Scandinavia and rather later in southern Europe. Tricholoma sulphureum has a yellow cap without the brown-olive central area; it smells strongly of coal gas. Although reported in some field guides to be edible and very tasty, and indeed having been sold as such throughout much of mainland Europe until recently, the Yellow Knight is now known to be toxic and should definitely not be collected for the pot. The poisonous chemicals in these fungi have not been definitely isolated, but several cases of painful muscle damage have been attributed to eating these chunky fungi.